OH, we are so very close now. I'm actually 39 weeks today, so I'm behind on the updates once again. 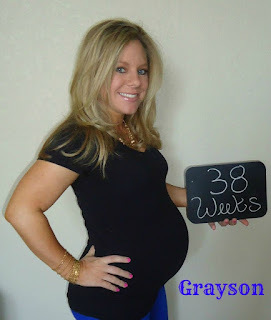 I was induced with Grayson at 38 weeks 6 days, and I had him at 39 weeks exactly, so by tomorrow I will officially be the most pregnant that I have ever been. I'm still feeling way better than I did the first time around, so hopefully that will continue on throughout the remainder of the pregnancy! Although, I'm really hoping that the remainder of the pregnancy is not too long...mama is ready! is just getting bigger and bigger. According to Baby Center he's around 6.8 pounds and over 19 1/2 inches long. My doc doesn't do late sonograms, so we literally have no idea if he's measuring big or small...we haven't seen him since around 20 weeks! He apparently has a firm grasp and his organs have matured and are all ready for life on the outside. So come on out little man! Definitely feeling a little more pregnant these days. I've started swelling, hips are a little sore, back hurts sometimes. The main thing that's been bugging me is the fact that he has dropped, and his head is pushing down HARD. And often. And it huuuurts. I also was quite convinced I was having contractions last week, but turned out to be a bit of false labor. I had a massage about a week and a half ago and the lady did accupressure or whatever it's called the entire time and basically almost killed me. That's when he dropped, and I was in intense pain for the next few days. It's been better the past few days, but there are certainly still moments when it feels like he's trying to break out of there! At the appointment Wednesday I was up 29 - still better than last time! 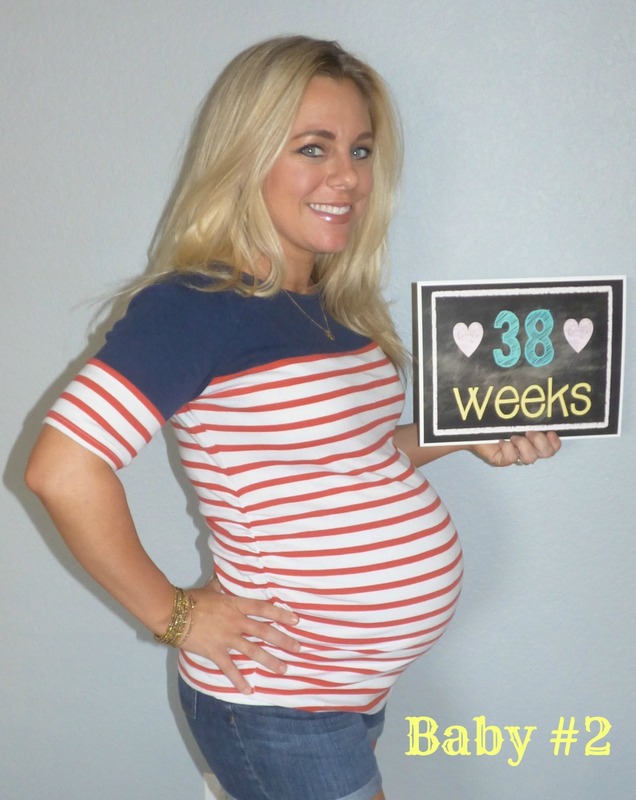 I was up 33 at 38 weeks last time, and gained 34 total. I'm hoping I can hover around 30 total this time, that would be fab. But I have been eating so horribly the past week or so, I may blow past that if he stays in there too much longer. Tonight we went out for my birthday dinner and I decided pizza was what I had to have - I would say pizza is probably the number one food craving I get, I usually have it about once a week. Other than that it's all sweets. All sugar, all the time please!!! He is still nutso. He's moving less frequently, but OMG when he does move he is caraaaazzy! He feels so huge. And he is seriously constantly head butting me in the cervix, which isn't the most pleasant thing ever. I still think it's amazing and wonderful and exciting every time he moves, but sometimes I'm like daaaang kid, take it down a notch! We've had a lot of "I can't wait for him to be here and to see how Grayson reacts" conversations over the last couple of weeks. It's so different this time, because we don't have as much of that fear of the unknown when it comes to what to do with an actual real, living baby, but more excited anticipation about becoming a family of four. He's been so insanely busy at work the last few months that I think he forgets I'm pregnant sometimes, but I can tell the reality is starting to set in for him. Well, the main thing that has been driving me CRAZY for the last several months has finally been crossed off the to do list - baby boy has a name! I am so insanely relieved. Hubs is serious about not telling until his arrival, but I will say it's kind of funny because this baby will be named one of the names that I wanted so bad for Grayson and that A didn't like. This time around, he was obsessed with this name and I was kind of like, eh, I'm over it. It was my favorite boys name for years and years, and I had others this time that I wanted more. But we finally came to an agreement on it, and I think we both feel pretty good about it :) THANK THE LORD! His arrival! This last part is so, so hard, just the anticipation of when is it going to happen? We are basically ready, aside from a few small things that I need to finish up, so I'm just ready for him to get here now. I believe I will let myself go until about 41 weeks before doing any type of induction, and at that point we would do stripping membranes versus inducing with pitocin or any real medical interventions. Soooo....he should be here in about two weeks, at the very latest. Fingers crossed he decides to come on his own before then, though. We are all so ready to welcome him into our little family! It is not fair how amazing you look! I am so excited for you!!! 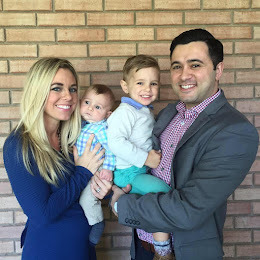 TWO KIDS?! Ahhh! I hope these final days go fast for you and you are able to relax! Praying for a smooth delivery and healthy mama and baby!